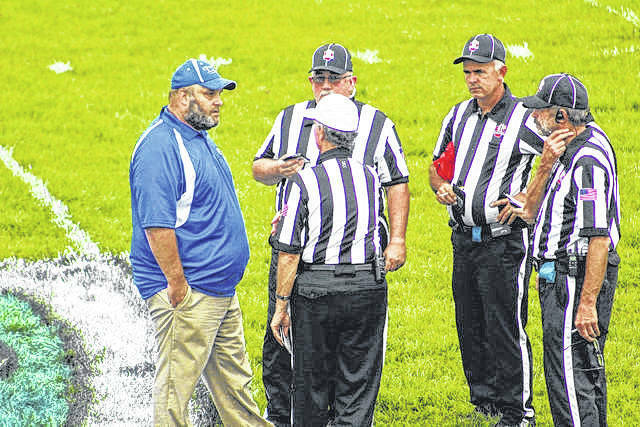 East’s James Gifford talks with referees before the Tartans’ contest against Green back in the fall. Gifford officially made the move to South Point after accepting the head coaching spot on Monday evening. When a person puts as much into developing a program as James Gifford did, it’s only a matter of time before the work that’s put in by said person gets noticed by other programs across the area. And after turning the East football program from a unit that had suffered two consecutive losing seasons into one that ultimately collected three consecutive winning seasons, a 10-0 regular season mark in 2016, and the unit’s very first victory ever in postseason competition in 2017 with a 12-6 victory over Waterford, it was no surprise to see a program eventually come calling for the former Division I FCS athlete. For Gifford, South Point, who came calling for the seventh-year Tartan hand, ended up being the very place that wooed Gifford away. The third-year head coach, who served as an assistant for four years under the East banner, ultimately accepted the open head coaching job with the Pointers’ football program on Monday evening to bring his widely successful coaching tenure at Sciotoville to its end. However, it certainly wasn’t a decision that came without a lot of thought and consideration. At East, Gifford did yeoman’s work into leading the Tartans to their most successful three-year run in school history. After developing Tyler Gerald into a four-star recruit and a coveted Division I prospect, the head coach began to do the same with Blaine Scott between his final season as an assistant and his first year as the head coach of the program. Ultimately, Scott, too, became a highly coveted four-star prospect. However, Gifford did all of that while developing a team concept. In addition to creating scholarship opportunities for Gerald, Scott, and his son Ethan, the third-year head coach was able to establish a walk-on opportunity for Brady Douthat, who was developed into a highly successful quarterback and safety under Gifford’s tutelage. Behind the foundation that those individuals developed, along with the play of Akia Brown, Ethan Carver, and J.D. Hatcher, the Tartans ultimately claimed a 25-8 record during Gifford’s three seasons at the helm. Scott and Brown ultimately were named as All-State talents, Hatcher took half of his catches the distance in his senior season, and Carver ultimately rushed for over 100 yards and the game-winning score in East’s 12-6 playoff victory against Waterford that knocked a long-awaited door down. During that same tenure, however, Gifford also accomplished arguably two of the main goals outside of accomplishing the school’s first playoff victory by defending home and by holding serve against Notre Dame. In three years as the head coach at East, Gifford not only never lost a game against Notre Dame, but never lost a regular season home bout, period. And while he may be heading further east on U.S. 52 for his next coaching destination, Gifford only wants to see that success continue. “Hopefully, it continues,” Gifford said. “I want nothing but success for East football and Sciotoville Community Schools. They’re special people and they deserve special things. Hopefully, it’ll continue on, and the players will rally together. Whoever it is that they select for their head coach, I’m sure that the administration will do a great job picking the next head football coach, and football will continue on at East High School. At South Point, Gifford has wasted no time assembling a staff. In a matter of 36 hours, Gifford not only retained Chris Adams on the staff, but is in the works of hiring two additional members to the football program en route to showing the passion that a program, who only has four wins total over its last four seasons, sorely needs. The Piketon native plans to hire a fourth full time coach, along with two volunteer assistants, on down the line. But Gifford didn’t lie — he’d love to have each of the four assistants that are on his now-former staff at East. Make no mistake about it, though — the blueprint for success at South Point will be the same was as it was at East. The understanding of what football should be used for, however, was what made Gifford and the folks inside the Sciotoville community such a great fit together.